Postcard US-1804465 to Germany shows a flaming sunset view at the Valley of Fire, the oldest and largest state park in Nevada located 55 miles from Las Vegas, dedicated in 1935. The Valley of Fire got its name from red sandstone formations, formed from great shifting sand dunes some 150 million years ago when dinosaurs were around. You can find areas of petrified wood and early Indian petroglyphs throughout the park. There is a diverse desert bio-community that features creosote bush, burro bush, and brittlebush; beaver tail and cholla cactus; springtime blooming plants such as desert marigold, indigo bush, and desert mallow; birds such as raven, house finch, sage sparrow, and roadrunner; lizard and snake; coyote, kit fox, spotted skunk, jackrabbit; and the desert tortoise. 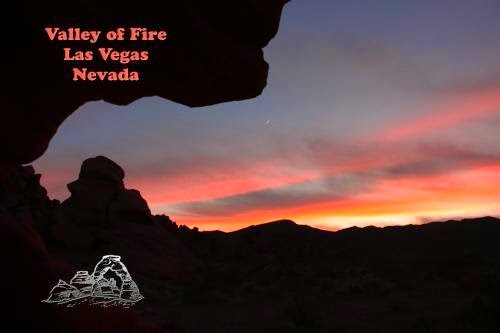 The Valley of Fire was designated as a National Natural Landmark in 1968. The park is also marked as Nevada Historical Marker #150. 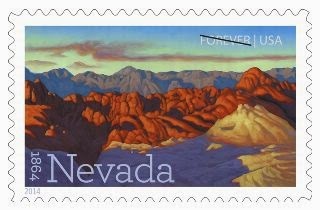 A close-up view of an area in Fire Canyon, part of Valley of Fire, has made on to the Nevada Statehood Forever Commemorative stamp, to be issued by USPS in Las Vegas, NV on May 29, 2014, to celebrates the 150th anniversary of Nevada statehood. The oil-on-Masonite panel was painted by Nevada artist Ron Spears.